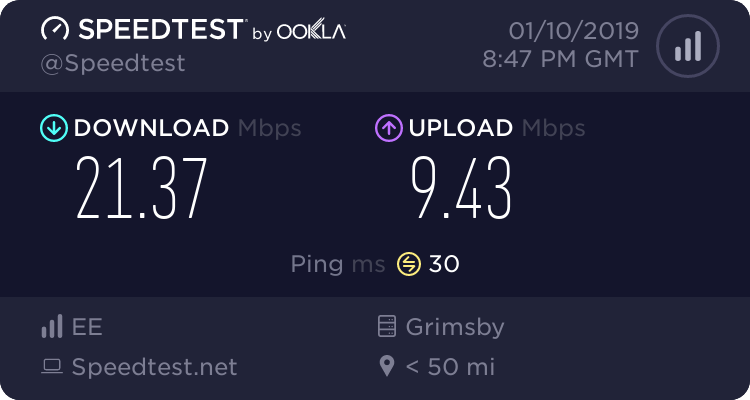 Re: New EE Customer paying for 76Mbs.... Not even close. New EE Customer paying for 76Mbs.... Not even close. Have EE/OpenReach forgot to flick a switch .?? Will it speed up after 7 days "Settling Period" .?? Had a BT engineer out. Line was faulty. It's up to 76 Mbps it depends on the quality of your line and the distance from your local cabinet to your house. According to the engineer, should be getting 60+ Mbps no problem. 2. 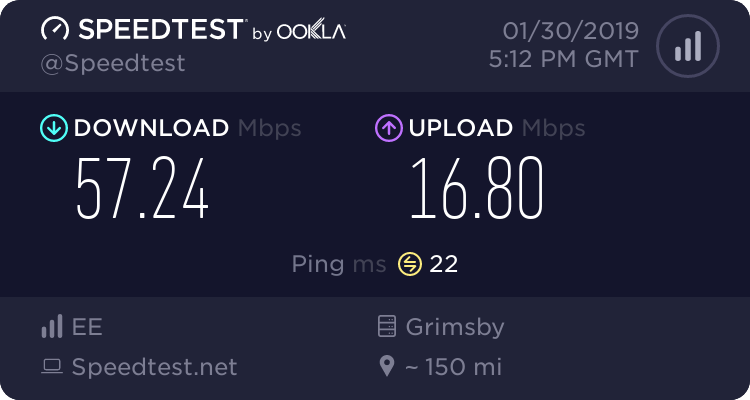 Try a wired speedtest, using an Ethernet cable supplied with the router, here http://www.thinkbroadband.com/speedtest.html . Click on the "Results Page" button at the bottom of the graph you first see and then copy to here just the "Link to this result:" link that you see below the next main graph. 4. What does BT Broadband Availability Checker estimate for your phone number? Post just the whole table and the line above it, blanking out your phone number. If it doesn't recognise your phone number, use the Address Checker, not the Postcode Checker. Thanks & now the BT Broadband Availability Checker ? Your sync speed is below the Handback Threshold. Reboot the router & try plugging it into the hidden test socket that is revealed when you remove the bottom half of the split faceplate (2 screws or press tabs) of your master socket. Only do this if you have a split faceplate. Do you have any extension sockets in the home even if unused? Are there any wires connected to back of faceplate of master socket? Try the BT Quiet Line Test (dial 17070 Opt 2), preferably with a corded phone, in the test socket with the router disconnected. If there is any noise, report it to your landline provider as a voice fault (don't mention Broadband). Often sorting out voice faults will fix the Broadband as well. Post the full router stats when plugged into test socket. Is the issue any better? Thanks! You're welcome :)! Glad I could be of assistance & it is now sorted.